How did my January piece develop? 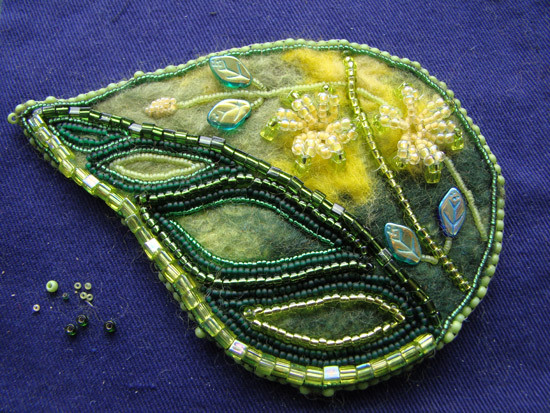 The initial inspiration was the Winter Jasmine in the garden so a colour scheme was chosen and a desire to learn barnacle stitch to create the flowers got me started. 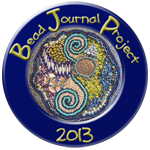 I also wanted to follow Robin's idea of improvisational beading so tucked away a thought at the back of my mind. Me and New Year Resolutions. Well I got this far and couldn't decide whether it was finished. I liked the little felt leaf shapes that appeared on the one side but also wanted to have a solid block of beading. 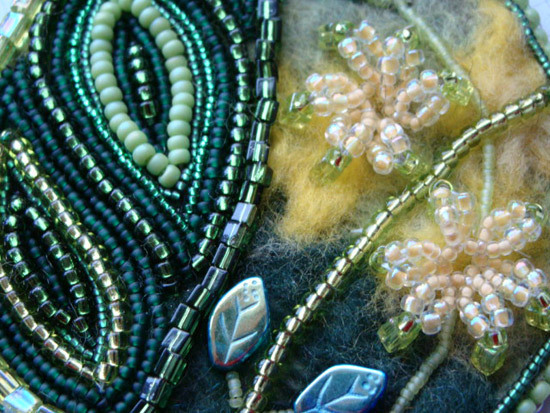 Just couldn't make my mind up to add more beads or not. 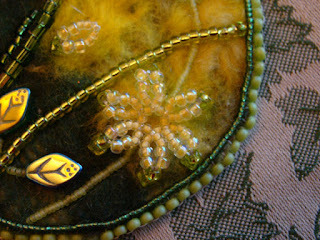 Finally I decided it just didn't feel finished and continued beading. The thing that strikes me at the end is that their are two very different sides just like me. On one hand I love being creative, going with the flow and putting off all the chores and daily organisational tasks and yet on the other hand I like things to be sorted and to have a plan. The underlying structure makes me feel calmer and gives me the freedom to be creative. Up until now I hadn't made any New Year Resolutions apart from the obvious one of losing weight but have decided on two more now. 1. Enjoy the time sorting out the messy corners that appear and tying up those loose ends for the calmness it brings. 2. Enjoy the time learning new skills and being creative for the happiness it brings. One of my favourite quotes is by Pablo Picasso " Art washes away from the soul the dust of everyday life." However as much as I need art and being creative I also need the more mundane things to be in order too. Am I happy with my finished piece? Yes, I think there is a balance. I had wanted that free flowing side to encroach on the structured side just as in life I wanted more creative time and to forget the ordinary daily stuff. However in truth I'm happier when things are in balance. The time spent sorting, organising and planning is just as valuable as the time spent being creative. 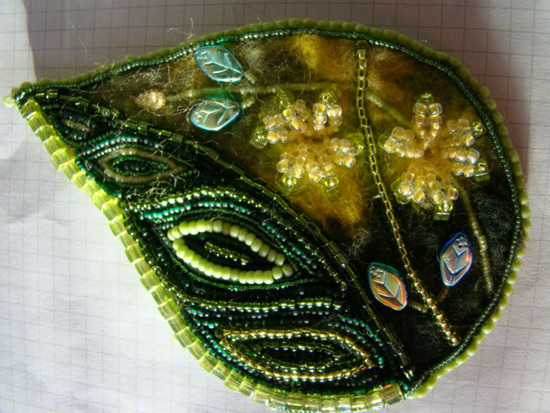 I liked the felt showing through the leaves but I also like the leaves with the additional beads - it's beautiful either way! Lovely! You have created a beautiful work of art! This is just beautiful! Your blog posts are very enjoyable! Thank you for all your comments. It is a delight to know someone is looking and great to hop across to your blogs and be inspired.